Mila has been spending the last few months with Jack Dandy, learning how to be a real girl and live in society. When he breaks her heart she runs away and joins the circus, determined to be independent. While Jack is trying to find her and bring her home, Griffin King is captured by Garibaldi and taken into the Aether. Finley, desperate to rescue him, temporarily dies in order to go into the Aether and bring him back. I loved this book! It is the final installment in The Steampunk Chronicles, which is bittersweet because I’m really going to miss these characters. Everything finally gets wrapped up in this last book, and Griffin finally faces down Garibaldi for the last time. My favorite thing about this book was that it was centered around my favorite character: Jack Dandy. I’ve loved Jack since the first book, mainly because of his complex character. There is much more to Jack than meets the eye, and he hides his true self behind the criminal persona he allows other people to see. In this book we finally find out why Jack is the way he is and we get a closer look at the real Jack Dandy. Mila is another great character, and her interactions with Jack were great. She’s able to bring out Jack’s true self, and he allows himself to be vulnerable around her. She is incredibly strong and smart, and when she begins to fall for Jack he realizes he cannot allow that to happen because he believes that she deserves better. I really loved their story and the way Mila refused to let Jack treat her like a child. Meanwhile, Finley is trying desperately to save Griffin from the Aether. Garibaldi imprisons and tortures Griffin, and Finley must temporarily die in order to enter the Aether to find him. The whole group bands together to try and defeat Garibaldi once and for all, and make sure that Griffin does not get killed in the process. In order to defeat Garibaldi, Griffin must face the magnitude of his ability, something he has been afraid of his whole life. 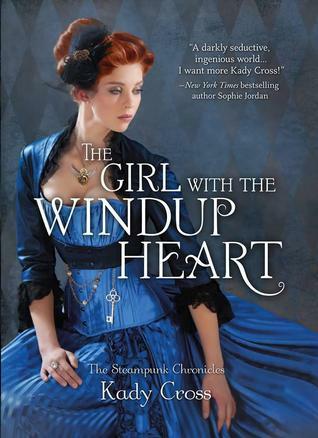 Overall, The Girl with the Windup Heart was a great final installment in The Steampunk Chronicles. I loved Jack and Mila’s story and the way the series ended, but I will miss these characters very much! The Girl with the Windup Heart will be released on May 27, 2014.